Visiting the dentist is never at the top of anyone’s fun list; and we’ll be honest, sometimes it hurts our feelings. There are some top reasons people avoid going to the dentist, but no matter what your reason for not keeping your appointments at my dental office in Long Grove, we’ll be happy to reassure you that you’re coming to the right place and that we’re here to help you. Some people are scared of spiders, others of clowns or snakes. There are even people with an incredibly real fear of the dentist. Dentophobia, or fear of dentists, plagues an estimated 75% of the population and ranges from mild to severe. This fear can result in some scary health concerns too. Since those with a high level of fear completely avoid the dentist, they’re never checked for oral cancer, gum disease, or potential problems that can lead to whole-body issues like heart disease, strokes, and many other dangerous and scary complications. When we talk about treatment options at my Long Grove dental office, we’re always asked, “Is it going to hurt?” The short answer is that modern dentistry and advancements in technology have made it easier to manage pain. Of course, the more detailed answer is found in the way we treat our patients. All of our care is designed to make you comfortable and relaxed, and our technology makes your treatments easy and virtually pain free. If you are still worried that your treatment will hurt, just talk to us about it. We’ll discuss the procedure in detail and get you completely comfortable before we begin. Some of the most up-to-date technology allows for easier, pain-free treatments. But they can still sound scary. Whether we’re filling a cavity or preparing you for a crown, the noise of the drill and other tools can be loud and instill fear. The fear is often escalated when an instrument is in your mouth as it sounds even louder than if you hear it outside of your mouth. While the tools may sound like they’re surely going to hurt, we can promise you that they won’t. 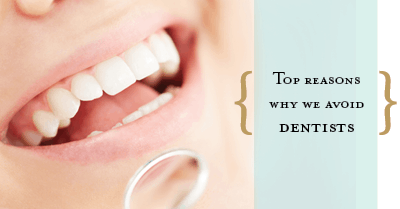 There are many reasons people avoid the dentist, and we’ve only touched on a few. But even if your reason for avoiding a visit to my dental office in Long Grove isn’t listed, please know that we’re hear to listen and we definitely won’t judge. Our goal is to make seeing us comfortable so we can work together to get and keep your smile healthy.